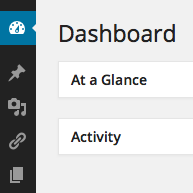 When you first log in to your WordPress Admin Section, you will see your Dashboard. The dashboard is a place where you can get an at-a-glance overview of your WordPress site and control all of the behind-the-scene details of it. After you explore your dashboard, you'll soon get comfortable with it and realize that it's pretty easy to use and navigate. First we'll take a look at the Dashboard home screen. After you first log in, you'll see a top welcome box from WordPress with some quick links to help you get started. The Dashboard Screen presents information in blocks called modules. Each module can be toggled open or closed by clicking in the top right corner. Modules can be moved up or down, or column to column. In the screenshot below, the modules such as "At a Glance," "Quick Draft" and "Activity" are all toggled closed. In the Dashboard Screen, there is a navigation menu called The Dashboard Menu. It is located on the LEFT SIDE of the Dashboard screen. This menu can be collapsed or expanded. You can see it in the screenshot on the left next to the expanded "At a Glance" module. It is the long skinny vertical menu with a black background. Example #1 (below) shows a collapsed menu with icons. The icons are links to important pages in the admin section. Example #2 shows the expanded view with text next to the icons. Example #3 shows what the menu looks like after pressing the Posts link. You will be taken to the Posts page where you have the chance to add a new post. There is also a Pages link if you want to add a new Page instead of a new post. If you decide to add a new post, you will be taken to the POST EDITOR. If you decide to add a new page, you will be taken to the PAGE EDITOR. This is what the WordPress "Add New Post" editor looks like. You will be able to type sentences in the box and format your text using the buttons above the editor. You can add a title in the first empty box. You can also add images. Look for the little camera icon next to the words: ADD MEDIA. 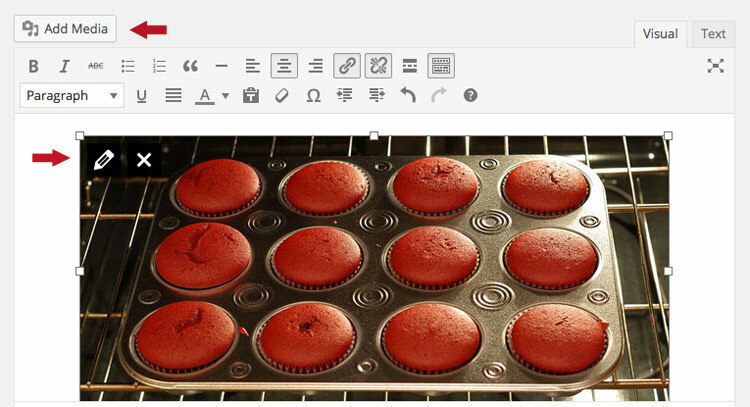 WordPress makes it easy to add images to your content. Place your cursor where you would like the image to appear in your post or page, then click on the media icon above your post/page editor. Once the image uploading process has completed, you will be given the option to edit some settings before inserting the image into the post/page. 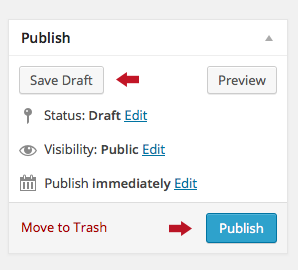 On your ADD NEW POST page, you will also see the WordPress Publish Module similar to the image on the left. Once you type the paragraphs of your NEW POST, you will need to either press the SAVE DRAFT button to save it privately so you can work on it later... or press the PUBLISH button so that your new blog post will be visible for anyone on the internet to see. This is a basic WordPress tutorial to help you become comfortable with your admin section. 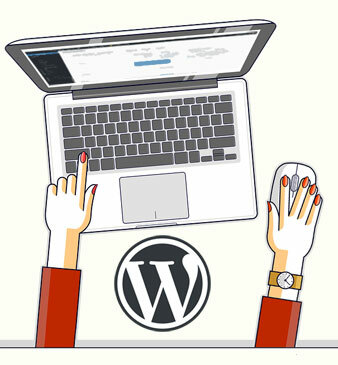 If these instructions seem relatively easy to follow, you will likely be successful with your WordPress website. If you have discovered that you're not interested in learning about the admin section, then a WordPress website may not be the right choice for you.